We're starting the new year with a splash of colour! 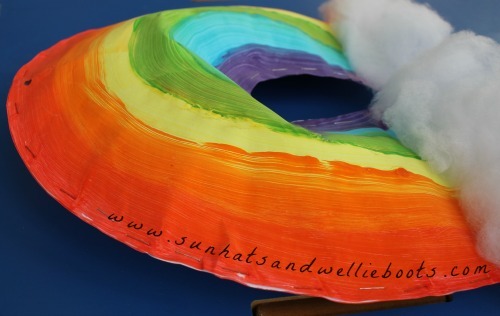 These Puffy Paper Rainbows brighten up any space & are perfect for sharing a sunny ray of hope on a dull day! The Christmas decs have just come down so everywhere is feeling a little dull, plus we've had a few grey January days so we thought we needed to add a little colour. 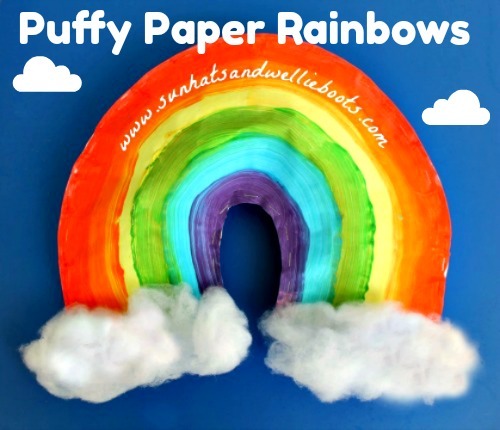 These puffy paper rainbows do just that, & are a great way of recycling any wrapping paper or packaging left over from Christmas. I've made several of these now with children of different ages & have just adapted the activity slightly each time to suit their abilities. For example, when I made these with preschoolers I created the puffy shape prior to the activity so the children could get painting straight away. In contrast, older children have loved drawing & creating their own rainbow shapes before selecting the paint & materials they wish to use. To create our Puffy Paper Rainbows we used 2 sheets of white A3 paper. You could use A4 or any size, but we found A3 paper gave us a rainbow which wasn't too small to paint, or to huge to hang up at home! 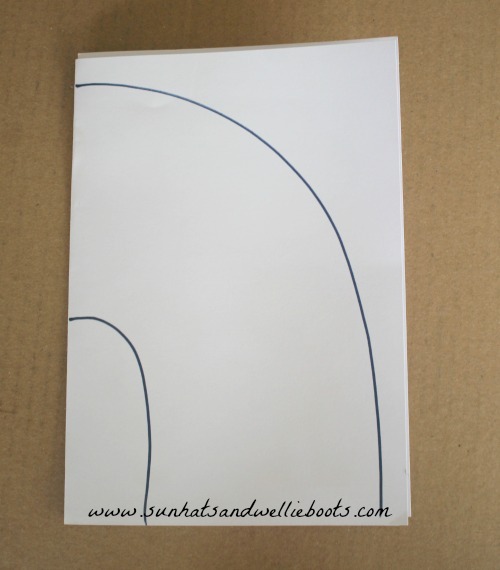 We folded both the sheets of paper in half & then drew half an arch/rainbow on one sheet. 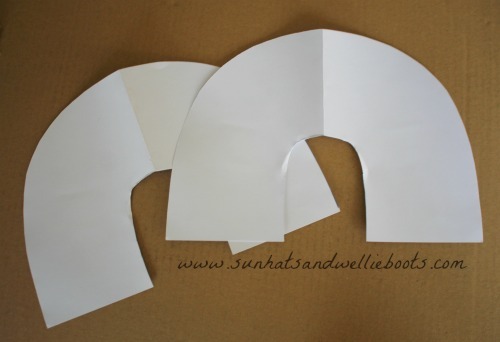 With both sheets folded together, we cut the shape out to create 2 rainbows. 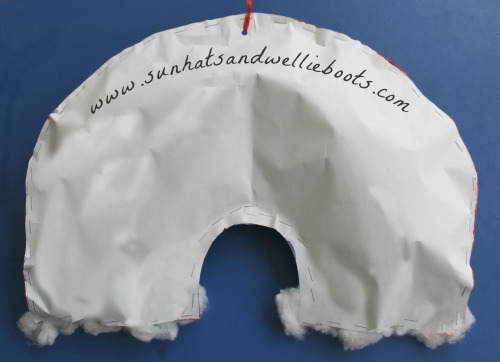 To make our rainbow 'puffy' we needed to create a pouch, so we stapled the outer edges of the 2 rainbow sheets together leaving the middle arch free so we could insert the paper. We then scrunched up old paper & magazines into rough tennis ball size shapes & filled the pouch with paper, making sure the corners were all filled. Then once our rainbows were puffy enough we simply stapled the open section together, & our white rainbow shapes were ready for some paint! We had a selection of rainbow coloured paints along with a variety of different sized brushes & sponges. 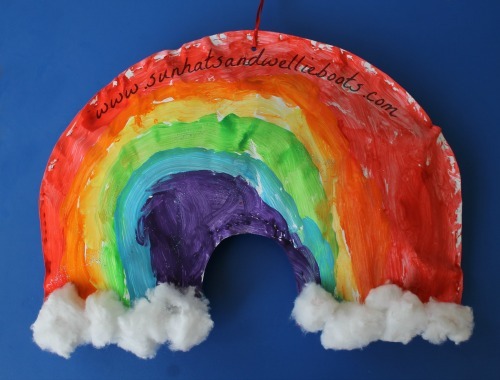 Most of the children created a classic rainbow, but others painted with their fingers or hands creating unique patterns & blending colours. 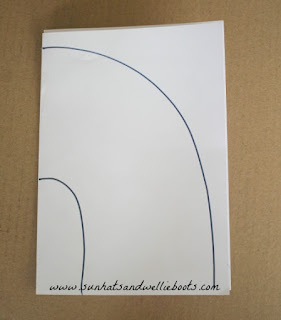 I love the freedom this activity offers & that you could create your own fabulous rainbow design! When the painting has finished you can either leave the rainbows to dry as they are or if you wish to give your rainbow a real sparkle just add a sprinkling of glitter so it sticks to the paint & then leave to dry. 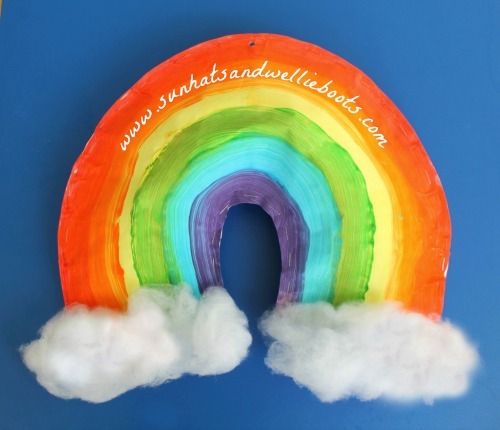 When our rainbows were completely dry we glued some cotton wool to the bottom edges to create some clouds. We then punched a hole in the top & threaded some ribbon through so we could hang our rainbows up. If you wish to have these hanging up & spinning around you could paint the back of the rainbow too. These would look beautiful hanging from any classroom ceiling. These rainbows bring a little joy & sparkle to any day, & are a great way for children to explore colours, patterns & textures.